It’s hardly worth pointing out that sushi is a full-fledged umami experience. 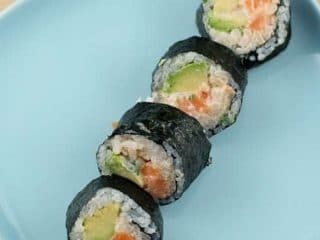 In this spicy salmon roll with avocado, the umami flavors owe to the nori, the spicy mayo, and to some extent the salmon and the shallot. Just as important as the umami itself is the range of other flavors and textures that it acts on. The creaminess of the avocado, the salmon and the mayonnaise, the spice from the Sriracha, the pungency of the shallots, the crunch of shallot and cucumber, and the saltiness of many of the ingredients all work together in an alchemy of taste. This dish, like all umami-rich food, is more than the sum of its parts. It eats like magic, but those parts were built from the ground up, with lots of attention to detail. Use sushi-grade/sashimi quality salmon, which has been flash-frozen and kept at a deep freeze to ensure no parasites survive. Having just moved from the urburbs to a full-on suburban town with a dearth of takeout sushi, we got our priorities in order. Step one, homemade sushi. Step two, umami bliss. Step three, unpack. 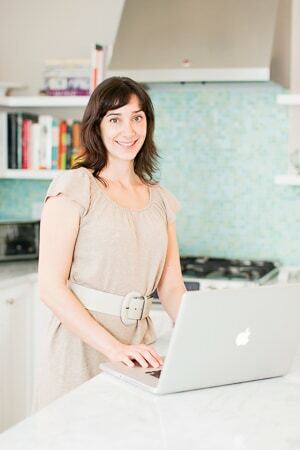 It’s hard to be taken seriously as an umami girl without a killer homemade sushi recipe. Still, I sure have taken my time sharing this one. Homemade sushi had been on my to-do list for years before I screwed up the roe to give it a try. (Wait, what does she think roe is?) I could never really identify what I was afraid of, but I never really had to, since totally decent takeout was always so readily available. 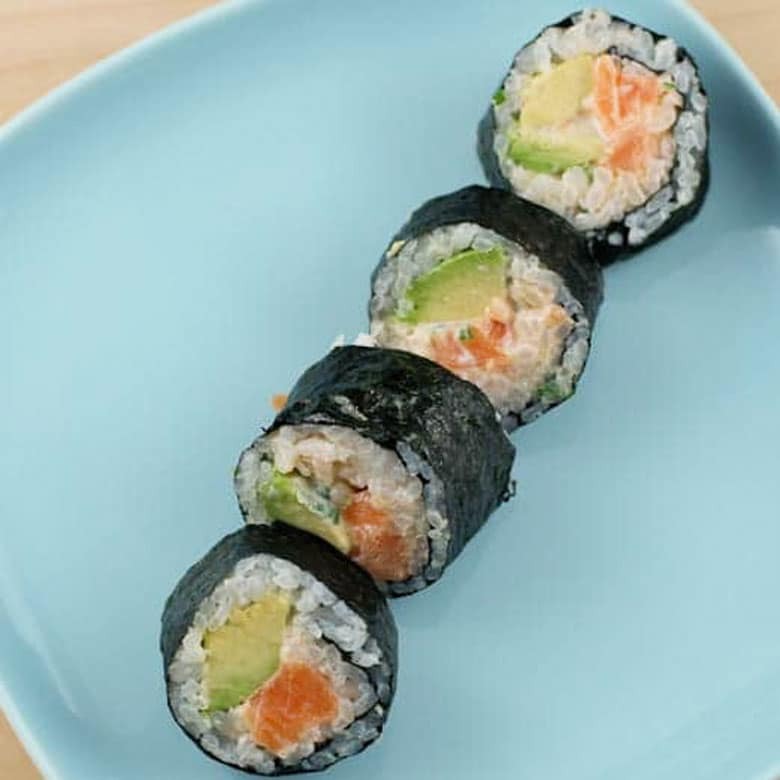 Spicy salmon roll with avocado is a fun, delicious, and totally achievable kitchen project. Homemade sushi is easier than you might think. Use sushi-grade/sashimi quality salmon. This isn't a technical designation, but it means that the fish has been flash-frozen and kept at a deep freeze to ensure no parasites survive. Place rice in a large bowl and fill with cool water. Stir with your hands for 30 seconds, then drain the water. Repeat this process until the water runs almost clear, probably 4 or 5 times. Pour the rice into a large pot (I like to use an enameled cast iron Dutch oven) and add 2 1/2 cups cold water. Simmer for 20 minutes without lifting the lid. Turn off the heat and let sit, covered, for 10 more minutes. Pour in the rice vinegar and stir with a wooden paddle (or a wooden spoon or stiff silicone spatula) for several minutes. Ideally you will be fanning the rice with a paper fan in your other hand while stirring, but the sushi will still taste good if you don’t. With a very sharp knife, cut the salmon into 1/2-inch-thick strips that are about as long as the short side of a piece of nori. Halve and pit the avocados. Slice the flesh lengthwise into strips and scoop it from the skin with a large spoon. Peel the cucumber, cut in half lengthwise and scoop out the watery center from each half with a small spoon. Then cut each half in half crosswise, and cut each quarter into 3 or 4 sticks. Lay a bamboo sushi mat on a cutting board with one of the short sides facing you. Place a piece of nori on the mat, also with one of the short sides toward you. Wet your hands (a bowl of warm water on the counter helps here) and pick up a small amount of rice (maybe 1/3 cup). Using your hands, spread the rice fairly evenly over the surface of the nori, leaving the half-inch strip farthest from you riceless. You don’t need to spread the rice perfectly to end up with good-looking sushi. Near the end closest to you, lay a strip of fish and some avocado and cucumber across the entire width of the rice. Spread on a generous bit of spicy mayo and sprinkle with roe, if using. Using your finger, wet the bare strip of nori to ensure it will seal the roll. Lift up the edge of the bamboo mat closest to you and tuck your thumbs underneath. Use the rest of your fingers to hold the fillings in place for a moment while you roll the mat once away from you to enclose the filling in the nori. Continue to roll the mat away from you, pressing gently and pulling slightly toward yourself at the bottom, to shape the roll. Wet the tip of your sharp knife, cut the roll in half crosswise, and then slice each half into three or four rounds. Serve with soy sauce for dipping and wasabi and pickled ginger, if you like.